Echinacea — a genus of herbaceous flowering plants in the Asteraceae family. 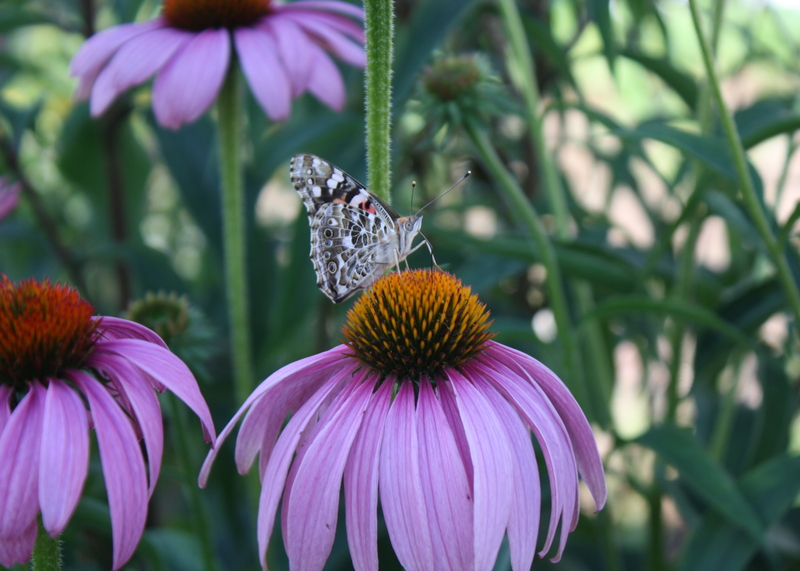 Commonly called Coneflowers, there are 9 species in the genus (according to USDA PLANTS) and they are endemic to Eastern and Central North America. 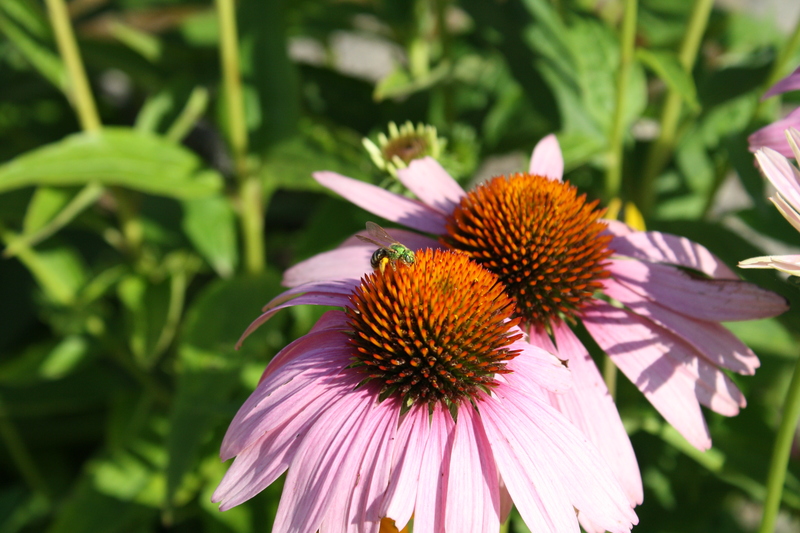 The word Echinacea comes from a Greek word meaning “spiny”, (as in Echinoidea, the word for sea urchin, ) and refers to the stiff, bristly center disk of the flower. 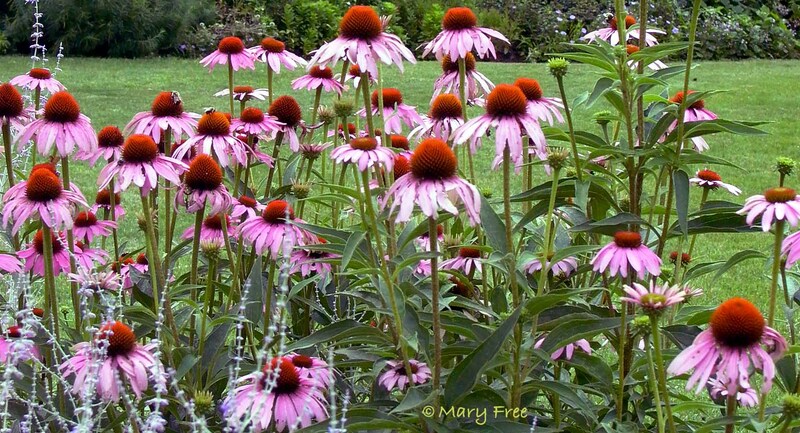 Echinacea is a great perennial garden plant. It is tough, drought tolerant, cold tolerant, and not invasive! They are impressively able to hold their own against insects and diseases as well. 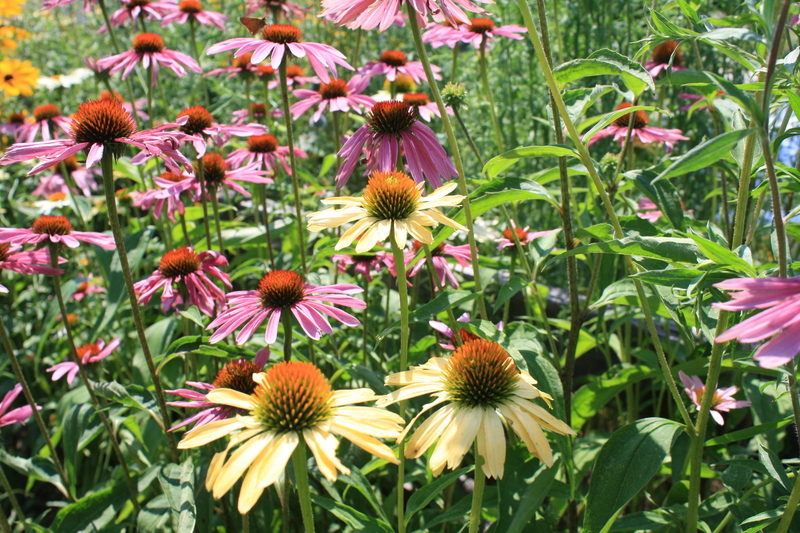 Three species —Echinacea purpurea, Echinacea angustifolia, and Echinacea pallida, have been utilized in creating new garden cultivars. There have been so many cultivars released in the past 10-12 years that it’s hard to keep track. One website I checked had 28, and another lists 53! There are a few Echinaceas which can be started from seed in January to flower the first season. ‘Cheyenne Spirit’ is one. This is unusual in a perennial plant and lots of fun for the gardener! 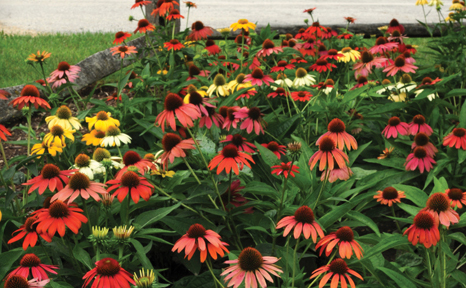 Seeds for the All- America Selections Display Garden have arrived and they include the appealing ‘Cheyenne Spirit’ Echinacea cultivar. 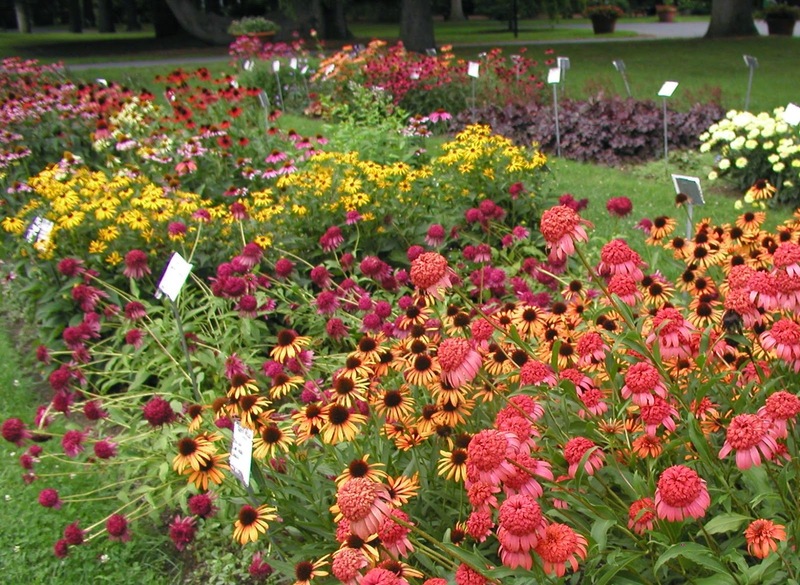 It’s shorter and stockier than the species Echinaceas, which can be 3 or even 4 feet tall. It is a rainbow of warm color tones, rich orangey red, paler orange, yellow, gold, pink, and cream. A sturdy little plant with long-lasting pretty flowers –what could be better? It’s not so busy in the garden and I have been thinking a lot and reading a lot about honey bees, being a beekeeper as well as a gardener. Everyone knows that it is hard times for the bees! Diseases, mites, lack of forage, and chemicals of all kinds are combining to take their toll. 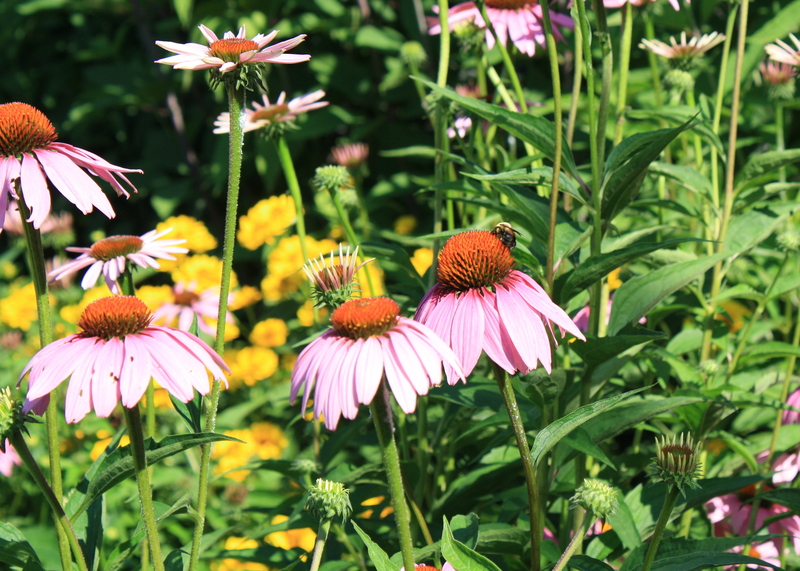 Last year I observed that bees and other pollinators love Echinacea purpurea, which we have here in the garden. 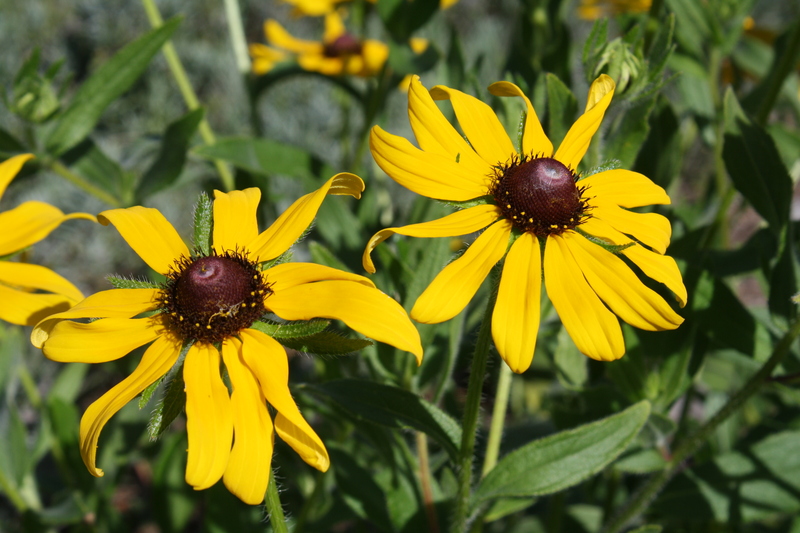 But the ‘Cheyenne Spirit’ and other recent cultivars had no pollinators visiting them. 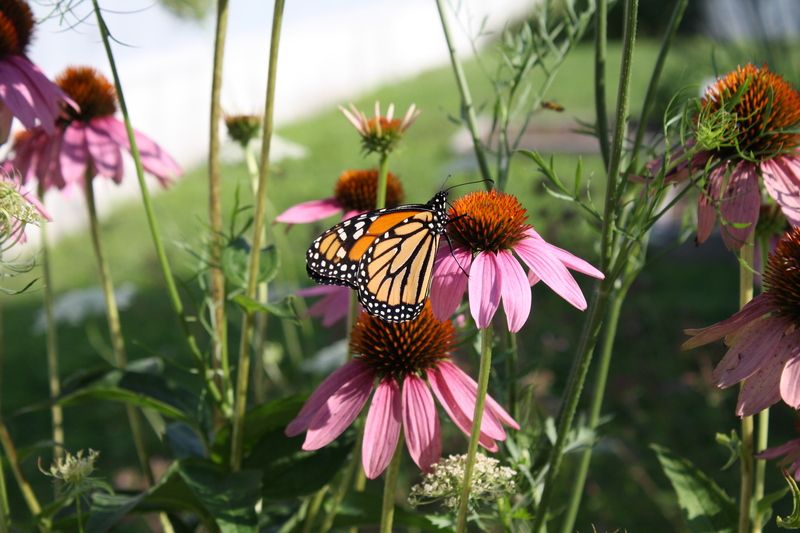 Like many flowers that have been “engineered” for certain qualities by plant breeders, they may no longer be particularly attractive to insects. It seems to me that much has been lost in this type of “improvement”. I am certainly not against improvement; for example, some hybrid vegetables have a welcome place in my garden. Disease resistance, drought tolerance, heat tolerance; these are plant “improvements” that we probably could not live without. And I am not against beauty, but I think in this case I find the beauty in Nature and her system of plants and pollinators who go hand-in-hand. To conclude, I will just say that I don’t want “beautiful” to outweigh “useful” in my garden. I want both! 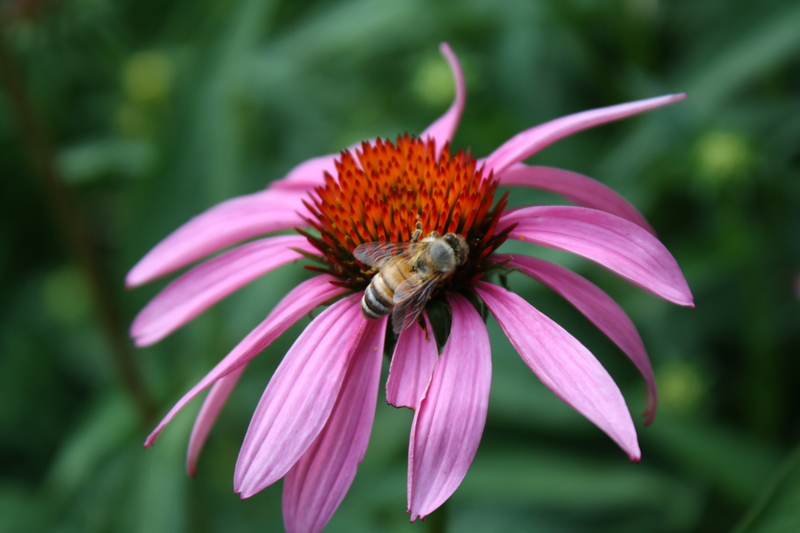 I would love to know what plants and varieties you find attractive to honeybees and other pollinators in your gardens. And another day I will fill you in on some of those other topics which distracted me today. This entry was posted in Botanical Gardens, Conservation, Gardening, Photography, Plants and tagged all-america selections, beautiful flowers, color, insects, pollinators on December 17, 2014 by uribg. 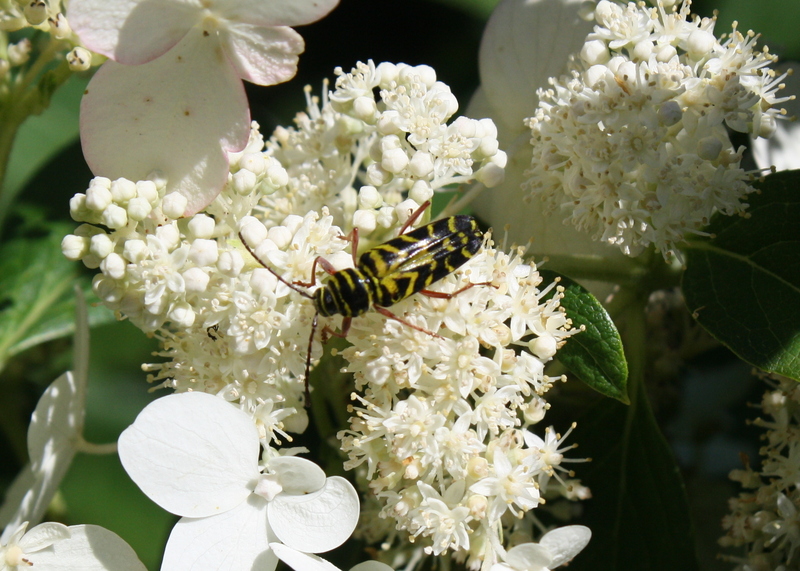 Megacyllene robiniae, the Locust Borer Beetle. A new one to me! Apis mellifera, warming my beekeeper’s heart, and an ant (Lasius niger??) on Hydrangea ‘Tardiva’. Solidago and Physostegia, the colors of September. This entry was posted in Botanical Gardens, Garden photography, Plants, Public Gardens and tagged autumn, insects, photography, pollinators on September 16, 2014 by uribg. 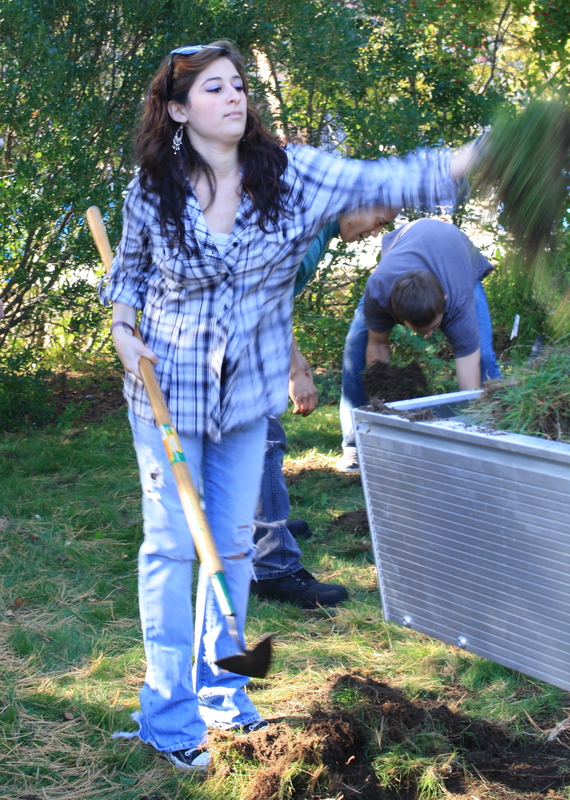 On October 17th, junior Kristie Saliba’s URI 101 class began installation of a “Native Plant System” in the URI Botanical Gardens. These students are interested in the Environmental Horticulture and Turf major, and it was a great hands-on experience for them. The first part of the job was to prepare the site, and like any job done well, it’s all in the prep! 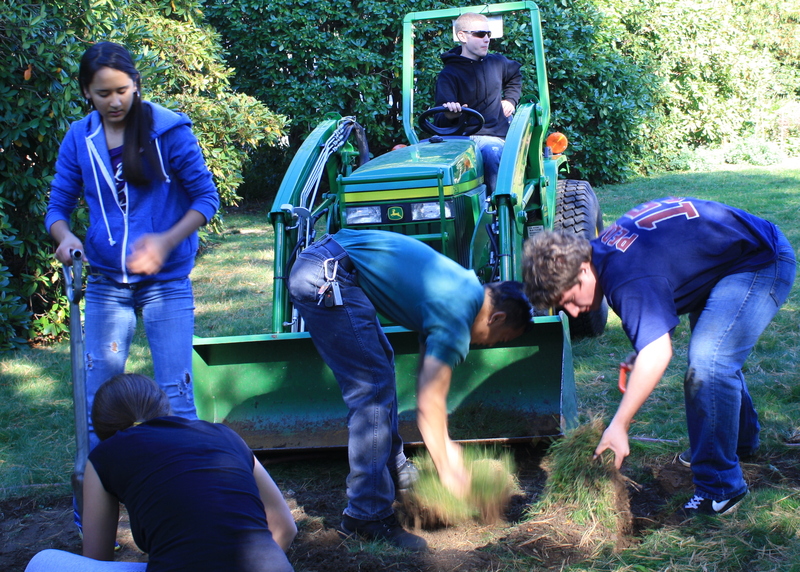 Kristie’s students spent about three hours removing sod and spreading our own Botanical Gardens compost on the area. 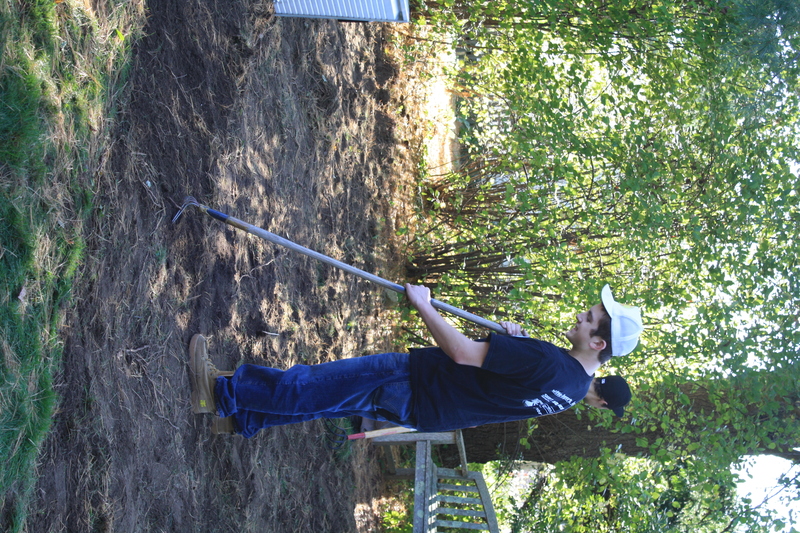 Mike and Kyle pitched in to help, as well as Kate Venturini, who designed the garden (and is the brains behind the Landscape Restoration Program at the Outreach Center). 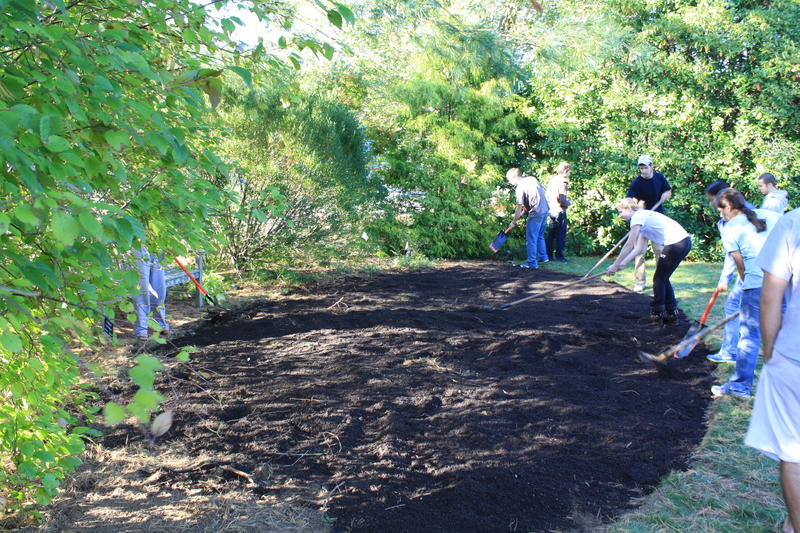 When the site was ready, volunteers from the URI Master Gardener’s Association began planting. 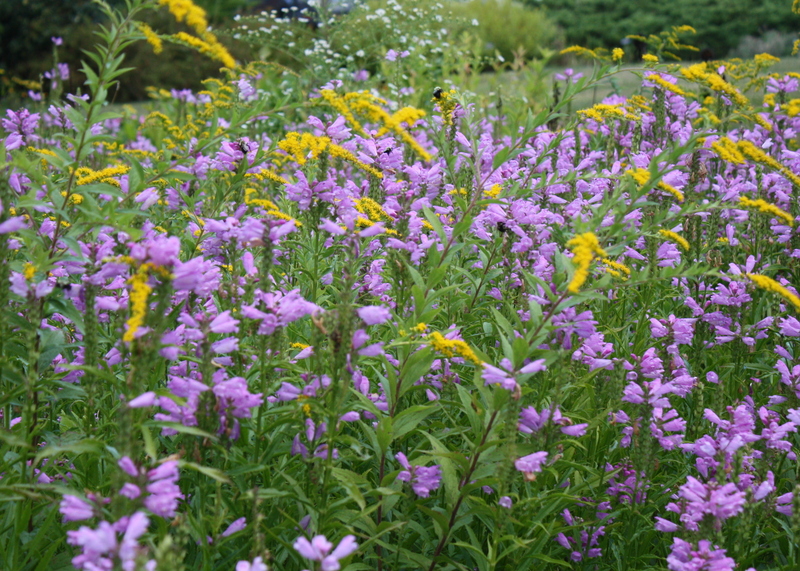 Native asters, goldenrod, and spiraea were donated by Rhody Native, the Rhode Island-grown native plants initiative. Vaccinium corymbosum (Highbush Blueberry), Lindera benzoin (Spicebush), and Arctostaphyllos uva-ursi (Bearberry) were donated by the URI Botanical Gardens. The installation will be completed next week, and while some of the perennials are still small, they are off to a great head start with fall planting. Of course, there are many native plants already in the Botanical Gardens, as well as beautifully adapted, non-invasive plants from other parts of the world. But natives are a fundamental part of the landscape, which this garden will highlight. As I explained on the garden tours this summer, “Native plants feed native insects, and native insects feed native birds and amphibians, and you can just follow that right up the food chain.” A simple way to understand the importance of these sometimes overlooked plants in caring for our landscape and environment. This entry was posted in Botanical Gardens, Gardening, Photography, Plants, Public Gardens, Uncategorized and tagged gardens, native plants, pollinators, sustainability, URI 101 on October 27, 2011 by uribg. It was all about the rhododendrons and azaleas in May, but now comes the glorious reign of the Queen of Flowers — the peony. 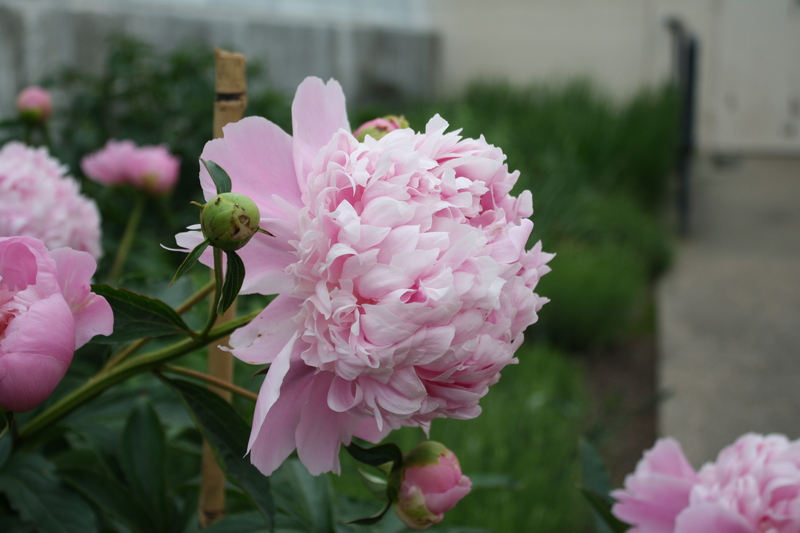 Peonies have been cultivated for thousands of years. In China they are known as the “flower of riches and honor”. In ancient Greece, they were believed to have been obtained by Paeon, physician to the gods, from the mother of Apollo on Mount Olympus. In the European and American “Language of Flowers”, which emerged during the Victorian era, they symbolized happy marriage, compassion, and bashfulness. I think of them as anything but bashful! I think it’s the fragrance that wins me over. 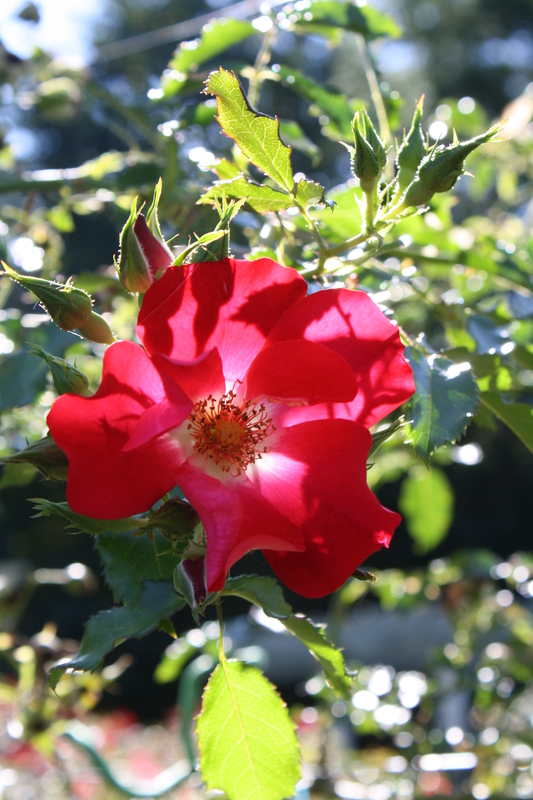 Like roses, but somehow better than roses…sweet and smelling of summertime. Of course the blossoms are spectacular too! Most of the herbaceous or garden peonies grown today are hybrids of either Paeonia lactiflora or Paeonia officinalis. There are hundreds of cultivars. The flowers can be single or double. The colors range from white to pink to red and even to yellow. 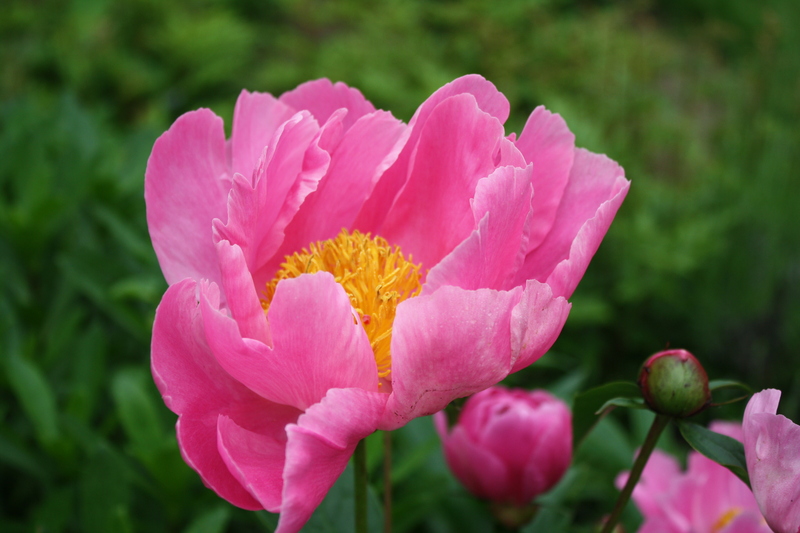 The newest innovation in peony breeding is a cross between herbaceous and tree peony types. Herbaceous peonies die back in winter, regrowing in spring, while tree peonies lose their leaves in winter, but leave woody stems. 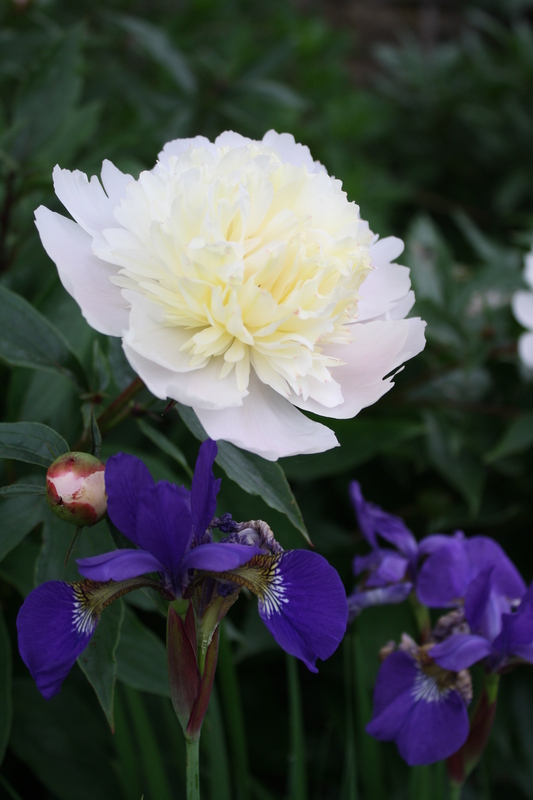 The cross “Intersectional” peonies have the leaf and flower form of the tree peony but die back, and have a bush growth habit like herbaceous peonies. “Peonies and ants: Talk about ‘Old Wives Tales’ ! Peonies in general do NOT attract ants, but some peony flower buds do. 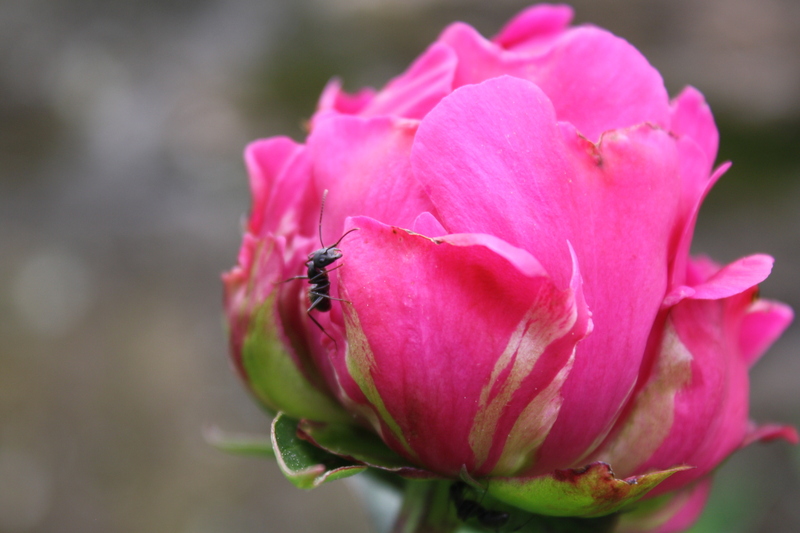 Do not try to get rid of the ants on your peonies. This is a natural and temporary activity. It is believed that peonies produce small amounts of nectar and other ant attractants to encourage ants to help in opening the dense double flower buds found in many peonies. The ants may be found covering certain varieties and avoiding others, this is totally normal. Once the buds have opened the ants will disappear – also normal.Some people think ants are REQUIRED to open the flowers, but this does not to appear to be true.It seems a debatable question whether ants are beneficial or harmful. I think they are neutral. These beautiful plants are easy to grow. They are hardy from USDA zone 8 to zone 2. They do best in full sun, and prefer soil rich in organic matter , with an ideal pH of 6 to 7. That said, they are tolerant of a wide variety of soils as well as drought tolerant once established. 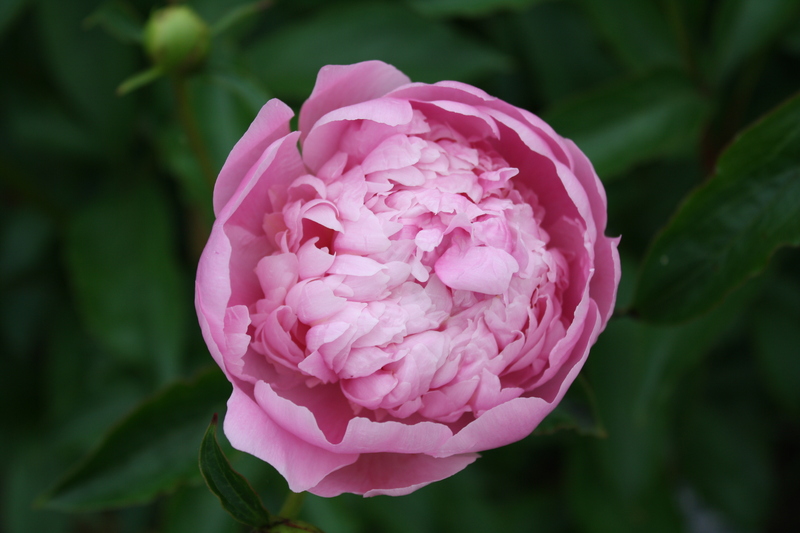 Once they are established, peonies prefer not to be moved, and can go many years without being divided. Saturday evening as I left the garden, there were two peony buds beginning to open along the walkway into the greenhouse. This morning when I looked, there were 22 fully open flowers! Like many things in the garden, peony time can be fleeting, depending on the weather. They don’t mind the heat, but rain beats them down rather quickly. The peonies here are mostly the old fashioned double varieties that need to be staked–the flowers are huge, too big to be supported by the stems. So I have them all staked, a labor of love, and they are beginning their spectacular display. In addition to the walkway, they are on the stage, along the west side of the Rose Garden, and behind the CE Outreach Center in the Kathy Mallon Garden. Come and see them, breathe deeply, and let summer begin! This entry was posted in Botanical Gardens, Garden photography, Gardening, Plants, Public Gardens, Uncategorized and tagged beautiful flowers, flowers, fragrance, gardens, insects, perennials, photography, plant photography, pollinators, summer on June 1, 2011 by uribg. One of the great pleasures of working in the Botanical Garden is the opportunity to observe insects. I love watching them, they look so BUSY and purposeful, totally ignoring me unless I remove their food source. Or squash them, which I try not to do. Most of the insects I see in the garden are pollinators. Because we maintain the garden without pesticides, a wide diversity of insect life is found, keeping most species within a reasonable balance. 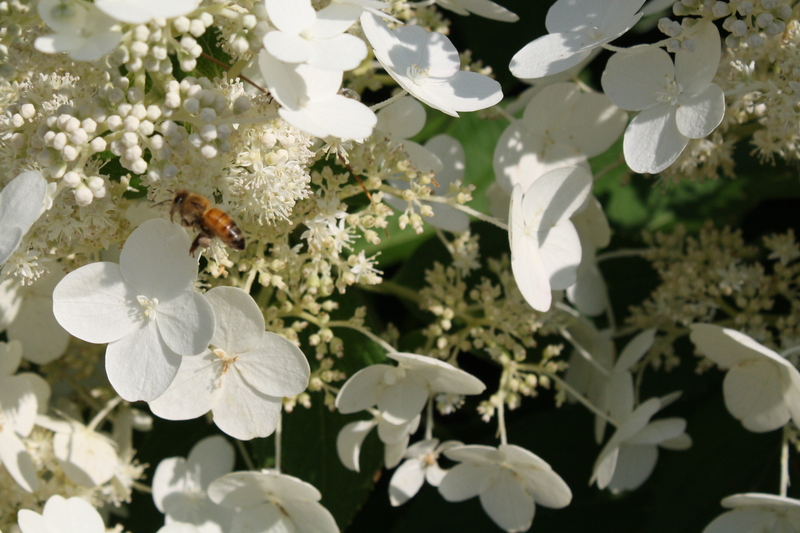 Therefore, our sustainable plantings are usually not devastated by “bad” insect attacks. 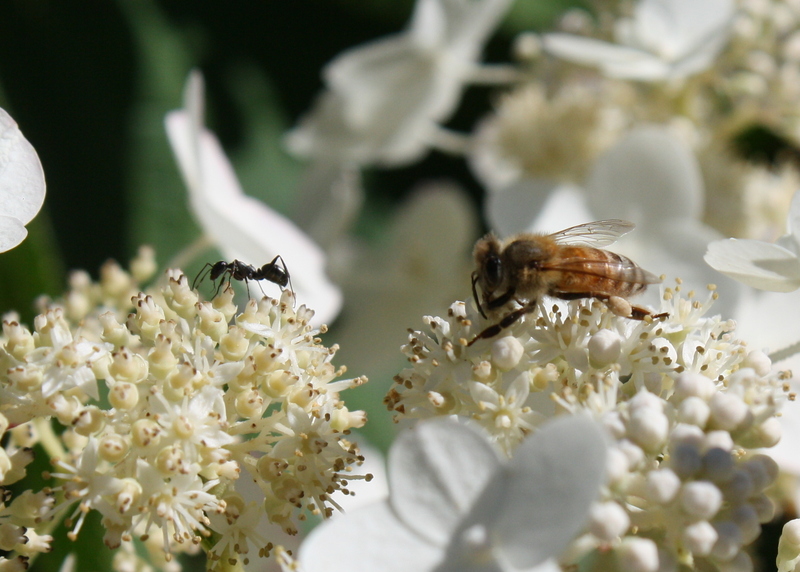 The pollinators are abundant and have plenty of nectar and pollen sources in the garden. In some cases, the insect can only feed on a certain plant and the plant can only be pollinated by a certain insect. Monarch butterflies are one of these, with the caterpillars surviving solely on Asclepias/Milkweed. Of course, there are generalists too, like the little wild bees in the second picture. These seem to come in all sizes, from large bumblebees to the tiny ones we called “sweat bees” as kids. I am always happy to see honeybees, since their population has been reduced drastically by disease and pesticides over the past few years. They are gentle creatures who really only sting in defense of the hive and queen. 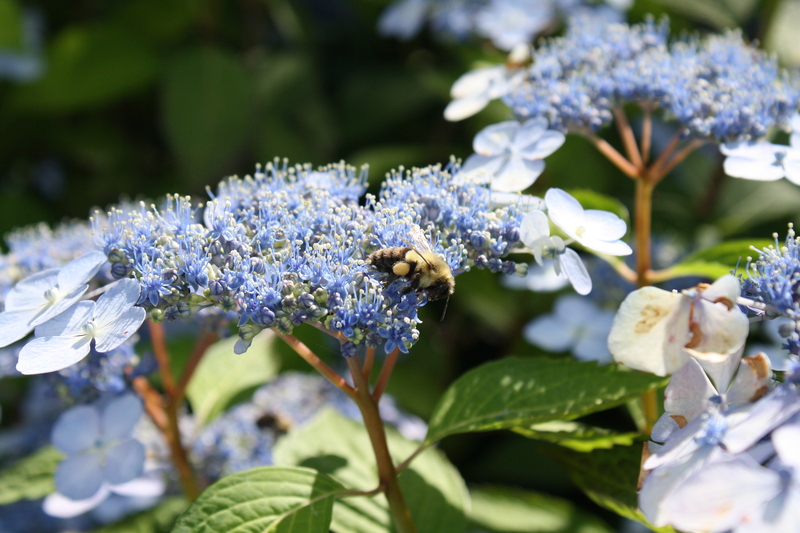 I’ve heard they will only forage from plantings which offer a large amount of nectar in one place (like a field of clover),but apparently a really big hydrangea is sufficient to draw them in. This entry was posted in Botanical Gardens, Garden photography, Gardening, Photography, Plants, Public Gardens, Uncategorized and tagged insects, pollinators on August 2, 2010 by uribg.